First he lost his single-digit jersey, then his confidence and finally his place on the team. A year after being Temple's leading receiver, Ventell Bryant was temporarily lost, not knowing whether a once promising football career could be revived. "There was a point where I felt I wouldn't be back," Bryant said in an interview last week. Yet Ventell Bryant is back and the redshirt senior is expected to be a leader of a deep group of wide receivers. "I was sitting home [Wednesday] night and finished putting my daughter to bed and I was thinking of Ventell and his journey and I shot him a text how proud I am of him and how much I believe in him," second-year Owls coach Geoff Collins said. Bryant, who played at Jefferson High in Tampa, Fla., redshirted his first season at Temple. The 6-foot-3 Bryant entered college weighing 169 pounds. He needed the redshirt season to get stronger and the next season he contributed 39 receptions for 579 yards and three touchdowns. In a nationally televised game against Notre Dame, a 24-20 defeat, he had six receptions for 91 yards. 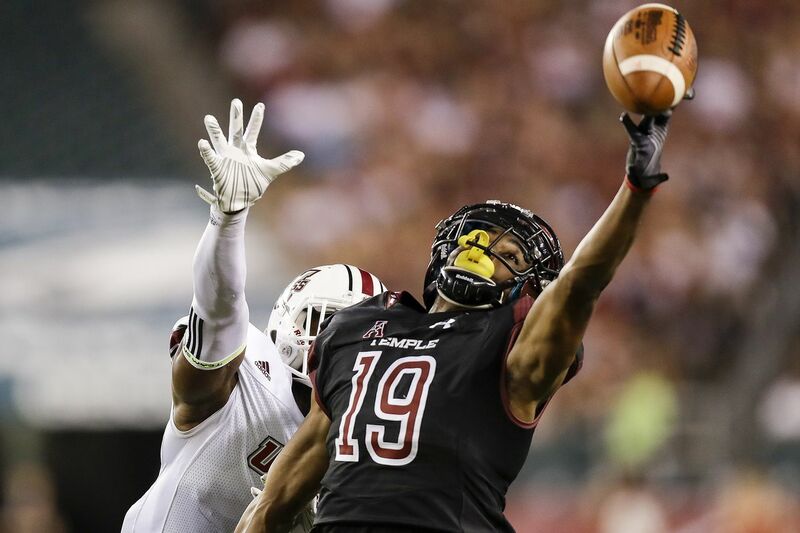 As a redshirt sophomore he led the Owls in both receptions (54) and receiving yards (895) as Temple won the American Athletic Conference championship. What made it more impressive is that Bryant missed three games after suffering an injury in practice. Days after that AAC title win, coach Matt Rhule left for the same position at Baylor and Collins eventually replaced him. "The coaching change affected me a lot," Bryant admitted. So did the injury bug. During spring practice in 2017, he suffered a hamstring injury, then tweaked it a few weeks before the opener at Notre Dame. Bryant didn't make the trip. He came back the next week with seven receptions for 79 yards in a win over Villanova, but that would be his single-game high last season for both receptions and yards. Before the 2016 season, he was awarded a single-digit number, an honor given to Temple players for their toughness and dedication. Early last season the digit was taken away, another indication that things weren't going well. Bryant said he wasn't 100 percent last season because of the injury. After he caught four passes for 29 yards in a 31-28 overtime loss at Army, his frustration boiled over and so did the coaching staff's. "I was dismissed from the team," he said. "I wasn't on the team for things off the field and it was a real rough time." The time didn't last long. A group of players went to Collins. "We have a unity council and we told Coach that we wanted Ventell back," said quarterback Frank Nutile. Collins reinstated Bryant after he sat out a 34-26 victory over Navy. "They felt so strongly about Ventell, what is in his heart, who he really is, and Ventell wasn't showing those things at times last season," Collins said. Bryant finished the season with 29 receptions for 280 yards and no touchdowns, well below his own expectations. "The thing is, once you lose confidence in yourself, or once you face adversity, some guys aren't able to handle it," he said. "I wasn't a guy able to handle it as well as I should have last year as far as my playing situation." Bryant could have left Temple as a graduate transfer because he has earned his degree in communications. "I wanted to finish what I started here," said Bryant, who entered camp at 204 pounds. "I am the first in my family to graduate from college," he said. "It is big for leaving that legacy for my younger brother." Most of all, Bryant said he appreciates a second chance. "I am a senior so this is it for me," Bryant said. "I have done a lot of things at this university and I just want to leave a good legacy for myself."